Gain 2credit for each card with at least 1 advancement token on it. 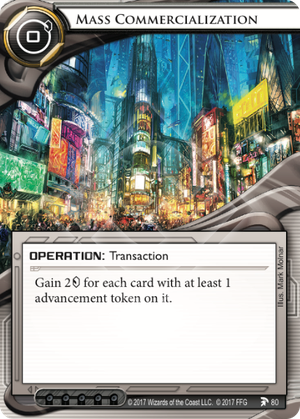 If Tennin Institute has placed an advancement token on a Runner card, does that increase the credits gained from Mass Commercialization? This card is very good! As noted by Silv, if there are just two advanced cards on the table, this becomes better than Hedge Fund. But in the right deck it can make ludicrous amounts of money. Let's take a minute to compare to its obvious cousin Commercialization. The problem with Commercialization is not that it only gives 1 per advancement token. It wouldn't be terribly hard to get four or more tokens on a card, therefore making this better than Hedge Fund. The problem is two-fold. If you are placing a bunch of tokens on a single piece of ICE, the runner is going to be pretty wary of it. He or she may just try to avoid the ICE altogether. The second problem is that you are putting all your eggs in one basket. If the right piece of Cutlery or a well timed Forged Activation Order strikes, then that whole investment is gone. Mass Commercialization avoids both these problems while also doubling the gain. Then too, it is influence free, so Tennin can spend their 15 elsewhere. This card obviously finds a place in any Tennin, Because We Built It, or Builder of Nations deck. But it may well be good enough to influence the construction of other Weyland decks. You might consider including more advance-able ICE in your Building a Better World deck. Advance just two ICE and you'll get 5 with a play cost of 0. Remember too that the tokens to not have to be on ICE. Traps and agendas count too (and runner cards if you are playing as Tennin). Now if you want to go all in with this card, there are several cards to consider adding as well. This includes, but is not limited to: Anson Rose, Space Camp, Satellite Grid, Shipment from Kaguya, Trick of Light, and Matrix Analyzer. Once you have two cards with advancement tokens on them Mass Commercialization becomes a better Hedge Fund (0 vs 5 to activate). If you have three cards with advancement tokens on them Mass Commercialization beats Restructure and IPO (6 vs 5 gain, not to mention the massive difference in activation cost). There aren't many cards with the sheer level of economic efficiency that Mass Commercialization can attain and with so few drawbacks. The flip side is that Mass Commercialization doesn't work unless you advance a lot of cards. Few decks actually have more than one or two cards with advancement tokens on them. There are two big exceptions: Weyland Consortium: Builder of Nations and Tennin Institute: The Secrets Within decks. BoN is obvious, its strategy relies on putting a one or more tokens on at least one piece of ice in every important server to make the runner bleed or scared (preferably both). BoN tends to rather quickly reach the critical 2 cards-with-tokens threshold necessary to make Mass Commercialization useful and BoN decks tend to have the infrastructure (Anson Rose, Space Camp, Shipment from Kaguya) to put tokens on a lot of cards. Tennin is a little less direct but it has the potential to put a lot of tokens everywhere, even on cards that can't be advanced such as Desperado. Mass Commercialization can be a good option to make some money while waiting for a scoring window. Because each card only generates at most 2 per Mass Commercialization it's hard to get enough cards with tokens to justify inclusion in most decks. From a game design perspective that's a good thing. It makes Mass Commercialization a powerful but uncommon occurance, not an overpowered staple. Having three operations in your deck that make money is obviously not enough. It's therefore good that Mass Commercialization works excellently both by the soon-to-be-retired Jackson Howard and replacements like Preemptive Action. Oh, and Bryan Stinson works as well (though playing Stinson on a zero cost operation just feels a little wasteful).